Heartwarming images of friendship between an Anglican priest and a Muslim imam fill an ad campaign produced by Amazon.com, in conjunction with American and British Muslim and Christian groups that debuted before Thanksgiving. The groups include the radical Islamic Circle of North America (ICNA) and the Muslim Brotherhood-connected Muslim Council of Britain (MCB). The Church of England and Christian Muslim Forum – an interfaith group in the United Kingdom – also participated. All of this would be charming were it not for the extremist and Islamic supremacist views that Amazon's Muslim partners have expressed in the past. These include anti-Christian and anti-Semitic sentiments, as well as the need to make their interpretation of Islam dominant over all the Earth. Amazon did not respond to a request for comment from the Investigative Project on Terrorism. The spot for Amazon Prime opens with the Christian clergyman inviting the imam into his living room. The two older men chat comfortably over a cup of tea, each grimacing with knee pain as they stand to say goodbye. The two men then go online and order knee braces as gifts for the other. The ad ends with each cleric donning the braces before confidently kneeling in prayer. "In an era of division and disharmony, Islamic Circle of North America (ICNA) is proud to have worked with Amazon, along with other faith-based organizations, on its ad for Amazon Prime. This ad goes beyond its objective of selling a product and highlights true friendship and caring, despite religious and racial backgrounds," ICNA's Sisters Wing said in a Nov. 17 Facebook post. The actors are an actual imam and Church of England priest, according to The Guardian. "We think it is a legitimate story. We are conscious that some people may be sensitive to it. It is about selflessness and thinking of other people," said Amazon advertising director Simon Morris. Amazon founder Jeff Bezos praised his company's marketing department on Twitter: "Love this TV commercial for Amazon Prime. Very proud of our ad team." 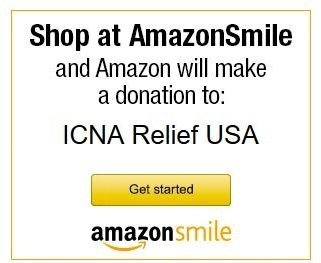 In addition, Amazon funnels donations to ICNA through its Amazon Smile program. Prime members can designate a charity of their choice, which then receives "0.5% of the purchase price from your eligible AmazonSmile purchases." The program includes "almost one million eligible 501(c)(3) public charitable organizations." ICNA retains a strong spiritual connection with Islamist pioneer Sayyid Abul A'la Maududi, founder of the radical South Asian Islamist group Jamaat-e-Islami, from which ICNA's founders drew inspiration. Maududi's works remain on ICNA's reading lists. Its Sacramento chapter recommends Maududi's Let us Be Muslims to high school students for its Young Muslims Islamic Quiz. The book has strong anti-Christian overtones, saying the religion is made up of a "hopeless mess of meaningless doctrines and empty rituals which could neither elevate the spirit, illuminate the intellect, nor move the emotions." It also claims that Christianity degenerated into "the lap of paganism." Back in 2012, ICNA's "Quiz on Competition on Islamic Knowledge and Skills" tested 11th and 12th graders on their knowledge of Maududi's book, Towards Understanding Islam. "The greatest sacrifice made in the way of God is jihad," the book, as it appeared on ICNA's Youth website, said. "In it man sacrifices not only his own life and belongings, but destroys those of others as well. But the Islamic principle is that we should suffer a lesser loss in order to save ourselves from a greater one. What comparison would the loss of some lives - even if it were thousands or more be to the calamity that would befall mankind as the result of the victory of evil over good." In Jihad in Islam, Maududi argues that Muslims should destroy "all states and governments anywhere on the face of the earth which are opposed to the ideology and programme of Islam regardless of the country or the Nation which rules it." In addition to Maududi, ICNA's Southern California chapter recommends books by Muslim Brotherhood ideologue Sayyid Qutb and Islamist spiritual leader Sheikh Yusuf al-Qaradawi. According to the 9/11 Commission Report, Qutb had a strong influence on Osama bin Laden's thinking. Qaradawi has praised Hitler for killing Jews during the Holocaust. Like Maududi and Qaradawi, who argue for the establishment of an Islamic state ruled by shariah, ICNA's 2010 Member's Hand Book teaches that the group's ultimate goal is to unite all Muslims under a single Islamic state ruled by a Caliph. ICNA's annual joint conventions held with the Muslim American Society (MAS) have featured numerous sectarian, hate-filled speakers. These include Jordanian professor Amjad Quourshah, who posted a screed on his Facebook page in August 2013 claiming that Coptic Christians in Egypt burned down their own churches. Muslim Brotherhood gangs carried out those attacks following Egyptian President Mohamed Morsi's downfall. Muslim Brotherhood leader Ragheb Elsergany called for violent jihad against Israel at the 2009 MAS-ICNA Convention and returned two years later to call for the Jewish state's destruction. Amazon also failed to vet the MCB, which has close ties with the Muslim Brotherhood. MCB strongly supported Hamas's European fundraising outlet, Interpal. Britain's Labour government cut off ties with the MCB for a year in 2009 after its leaders signed a pro-Hamas declaration. MCB's Secretary General Farooq Murad served as a trustee of Muslim Aid as recently as 2014. Muslim Aid is part of the Union of Good, which U.S. Treasury officials blacklisted in 2008 as a Hamas fundraising operation. Last spring, Huffington Post columnist Kashif N. Chaudhry noted that an MCB-affiliated group called Khatme Nabuwat celebrated the murder of an Ahmadi Muslim shopkeeper in Scotland on social media, saying, "Congratulations to all Muslims." A few days later, pamphlets saying "Kill Ahmadis" were found at Khatme Nabuwat's London mosque. The group's Facebook page says that it stands for "protection of Islam, and that is the biggest Jihad, anyone who dies fighting for this is a Martyr." MCB condemned attacks against Ahmadis, while sanctioning a belief that they could be regarded as non-Muslims. Critics have accused MCB of stalling an investigation into Khatme Nabuwat and suggested MCB isn't serious about combating violent extremism. Holiday messages of peace and friendship are sure ways to warm the heart. But Amazon's choice of Muslim partners reduces this campaign's intended message to a hollow public relations stunt.